Ah, National Paperclip Day And what is the most iconic paperclip of them all I hear you ask? 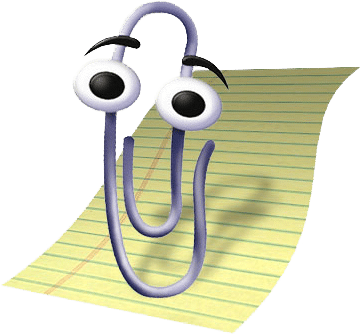 Clippy (a familiar sight for Microsoft Word users) of course! On the subject of paperclips, it sounds rather like per click don’t you think? So here are some top pay per click tips from Clippy! To work out how to get the most out of your AdWords campaign, narrow down your PPC performance data to hourly daily segments to see which hours are performing the best. It is vital that you regularly assess this data as it holds the key to how your audience is behaving online. With the data’s results, you are then able to adapt your bids and ad scheduling to attain a higher ROI. Create adverts specifically for mobile, using mobile dimensions and optimising them correctly so that there is an increase in click-through rates. Make sure you utilise your existing resources to help make your site mobile responsive. Consider using sitelink extensions that are mobile specific. These should be between 17 25 characters long. You can also implement Call Extensions so that users can click instantly to make a call. Search terms are constantly evolving and rarely stay the same. For this reason, regularly checking what search terms people are using will allow you to bin useless terms and replace them with the better performing ones in order to get the most out of your PPC budget. To do this, you can view the search terms report in the keyword tab to see how keywords are performing. If you’re an eCommerce business, remarketing is an effective way of magically making an image of a product of what a user was just looking at keep reappearing. The dynamic remarketing process works by redirecting a user back to a product page a user had previously clicked off. You can entice users back to your product/service by placing offers or discounts on your dynamic remarketing ads, and if you haven’t already, this is something you should definitely try! Even if you have the best PPC ad going, it means nothing when you’re directing leads to a poorly designed landing page that just isn’t in sync with your PPC ad. Bad landing pages can mean you are wasting your budget by missing out online conversions and are ignoring the user experience – and integral part of the sales process. Ensure you consider implementing all these PPC tips to develop and maintain continual successful campaigns.